Are you looking for the perfect add on to your bounce house rental? Look no further. We have a no mess, easy care, and fun solution. Our 7'x7' games are perfect for any occasion. They can sit in the yard for a birthday party or even generate money at your school and church fundraiser. These games take only a few minutes to set up and are small enough to fit almost anywhere. 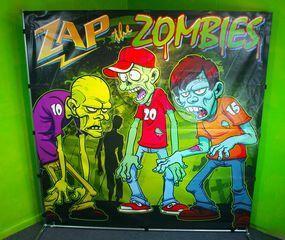 The Zap the Zombie game works with velcro that is strategically placed on the zombies and comes complete with 6 darts and 2 cross bows OR 6 velcro balls.